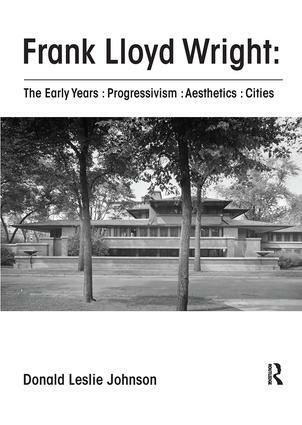 Frank Lloyd Wright : The Early Years : Progressivism : Aesthetics : Cities examines Wright's belief that all aspects of human life must embrace and celebrate an aesthetic experience that would thereby lead to necessary social reforms. Inherent in the theory was a belief that reform of nineteenth-century gluttony should include a contemporary interpretation of its material presence, its bulk and space, its architectural landscape. This book analyzes Wright's innovative, profound theory of architecture that drew upon geometry and notions of pure design and the indigenous as put into practice. It outlines the design methodology that he applied to domestic and non-domestic buildings and presents reasons for the recognition of two Wright Styles and a Wright School. The book also studies how his design method was applied to city planning and implications of historical and theoretical contexts of the period that surely influenced all of Wright's community and city planning.